Our custom Northern Lights tours are designed to guarantee you see the northern lights across much of Alaska, while keeping busy during the day. Our Alaska Northern Lights tours are exciting and rewarding for those looking to chase the aurora's. Our Northern Lights tours will further south than most, this is because we prefer the foreground that you generally don't get in other aurora shots. Our foreground has real mountains and large non-frozen lakes for beautiful reflections. Tours begin in Fairbanks to guarantee the best chance of viewing the aurora borealis. From there we watch the cloud weather and space weather and see what are options are. This tour can take us all over Alaska and the Yukon. Most common locations can include: Delta Junction (AK), Tok (AK), Valdez (AK), Talkeetna (AK), Paxson (AK), Whitehorse (YT), Kluane National Park (YT), Beaver Creek (YT) as well as many others with and without names. Each evening we will set out to maximize clear skies, aurora viewing, and diverse foregrounds. Our tours cover a lot of driving for maximum change of scenery as best opportunities for viewing the Northern Lights. Some nights may cover up to 500 miles of driving to ensure you get the best possible aurora viewing. For the more adventurous travelers this tour can include, remote off grid lodging and remote bush plane flights, if desired. 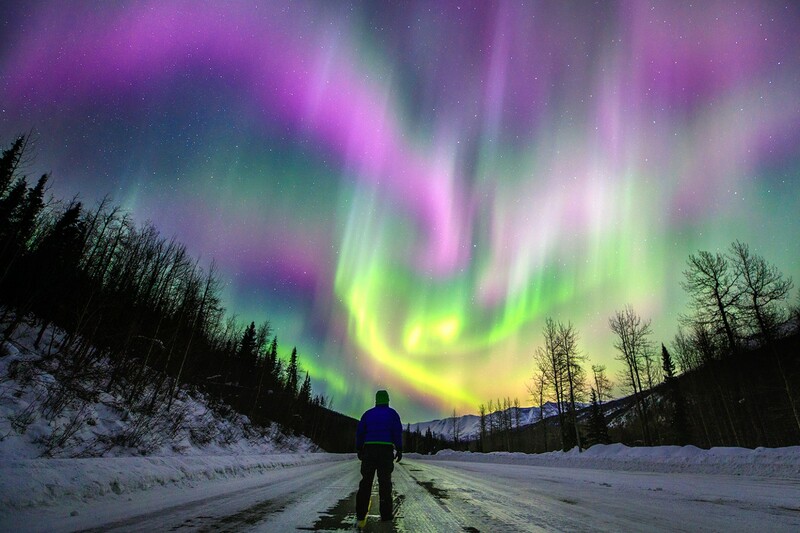 A man stands in amazement watching the northern lights dance above the Richardson Highway near Valdez. Entering back in to Alaska while chasing the northern lights along the Alaska Highway. Our northern lights tours chase the lights and weather to observe the best auroras. The sky fills with color while chasing the aurora borealis in the Yukon. The northern lights dance through the sky while traveling through the Yukon on our aurora borealis tour. The auroras dance across the sky and Dezadeash Lake while touring above Haines. The aurora's dance besides a full moon above Kluane Lake on our northern lights tour. Stopping at Kathleen Lake, Yukon to watch the northern lights on our guided tour. Watching the northern lights as we tour along the Alaska Highway. The northern lights spill out from behind a mountain on a guided tour. Watching the northern lights and a shooting star outside of Valdez. Watching the northern lights in the Alaska Range near Tok. Watching the northern lights dance among the Chugach Mountains outside of Valdez. The northern lights dance as the sun rises behind a teepee in the Yukon. Watching the northern lights from above Worthington Glacier. Watching the northern lights one August night from along the Alaska Highway on our guided tour. The northern lights filling the sky at Thompson Pass near Valdez. The northern lights over Port Valdez.